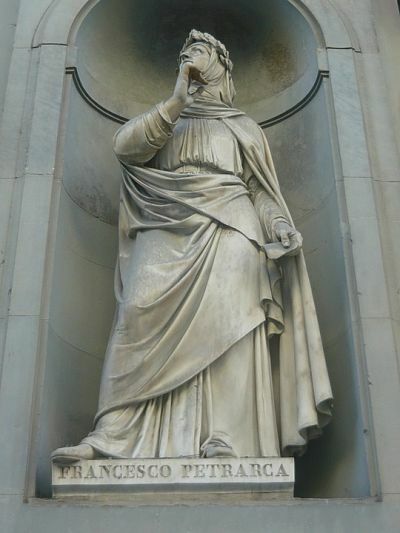 Francesco Petrarca was born in Arezzo on 20 July 1304. His father had taken refuge in Arezzo, sir Peter, little younger than Dante Alighieri, descended from a family of notaries from Incisa in Valdarno. In Florence he had achieved a remarkable position, However l ’ enmity of a powerful House of bankers forced him into 1302 to flee in Arezzo. His mother, Eletta Canigiani led Petrarca, only seven years in Incisa, where, in 1307 Gherardo was born, the brother of Francis. After moving to Pisa in 1311, moved to Avignon, in Provence in 1312, at the new residence pontificates, where he hoped to find employment. Because of the difficulty of finding a property settled in Carpentras. Here Francesco Petrarch studied subjects such as elementary grammar, rhetoric and dialectic, also he met Guido Sette. In 1316 I begin to take courses of all civil law ’ University of Montpellier (at the behest of father) along with friend Guido ’ Seven. The past four years in this town will then be judged by Petrarch as wasted time chasing useless knowledge. Among the 1318 and the 1319 He died prematurely her mother "that mother I seems to have been better than no ’ 've seen». In 1320 He moved to Bologna to continue his legal studies with his brother and all ’ friend. During the period when he was in this town was able to forge numerous friendships and touching poetry contemporary Tuscany, following the lessons taught by Bartolino Benincasa and Giovanni del Virgilio on Latin Classics (Virgilio,Ovid, Lucan, Statius). In 1326 with the death of his father he returned to Avignon, Petrarch. The 6 April 1327, in the Church of Saint Clare in Avignon first met a woman named Laura, destined later to become the great love of his life and the subject of the sentiment expressed in the Canzoniere. In 1330 taking minor orders and entered the service of Cardinal Giovanni Colonna as chaplain, while in 1337, after obtaining permission from the cardinal to Rome, later he moved to Vaucluse where he devoted himself to literary writing. In 1348 the plague loses some of his closest friends and Laura. Among the 1349 and the 1350 he was appointed Archdeacon of the Cathedral of Parma and Canon of the Cathedral of Padua. In 1350 he went to Rome for the Jubilee and passing through Florence was hosted by Giovanni Boccaccio , with whom he established a close friendship and deep sharing books and comparisons between classics and the new vernacular poetry. The 19 July 1374 he died in Arquà.